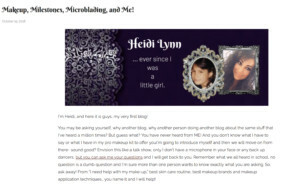 Heidi Lynn came to our team looking for a simple website backed by a clear vision of what she wanted. Guess what we did? We set her up with her web domain, and told her about Peasy Branding, and our talented past team member Mariah. Peasy Branding did a fantastic job delivering exactly what Heidi Lynn needed, and from there, we’re happily coaching her on blogging and SEO. Our goal is to give this savvy business owner all the tools she needs to be independent. Heidi Lynn has been making people sparkle for over 20 years as a licensed aesthetician, cosmetologist, and registered nurse. Makeup consultation, makeup application, and specialty cosmetic services are available for any occasion… check out her mad skillzzz!